We are a Wholesaler selling to businesses only. No retail orders accepted from the general public. Pikes Peak Rock Shop supplies products to Retailers only, with a minimum of $150 per U.S. order and $350 per international order. Sold by each. While supplies last, no backorders. Did you know: In 1852, Fluorite gave its name to the phenomenon of fluorescence due to certain impurities in the crystal. 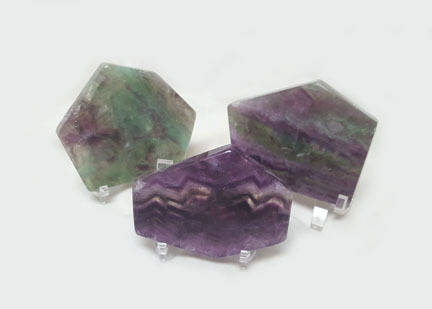 Our Mexican Fluorite Chunks are available in 8 price ranges. Sold in flats/boxes. NEW PRODUCT!!! Rough Chinese Fluorite Chunks Boxs are another addition to our ever growing line of flatted minerals. Each box contains 24 pieces of rough Fluorite pieces averaging to $0.75 each. These pre-boxed chunks are protected by a plastic "egg crate" so that each piece is cradled for safe shipping. 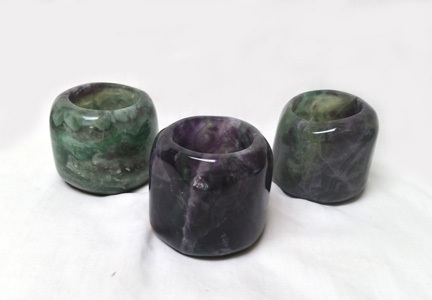 These colorful Chinese Fluorite Candleholders really are as unique as they are beautiful. 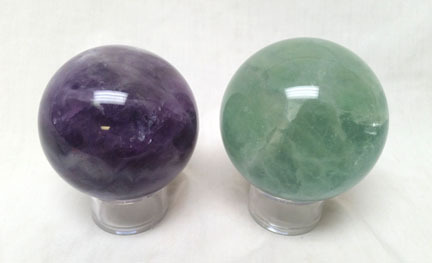 The colors can include any combination of the trademark Fluorite greens, purples, and/or white. They are approximately 3" across and stand 2.5" tall and comes with a tea light candle. They are fully polished on all sides and have a felt covered bottom. These gorgeous Candleholders ALWAYS sell out fast so get them while they last! A very popular addition to our selection of massage wands, these natural, multi-colored, ergonomically designed wands are as easy on the hands as they are on the rest of the body! 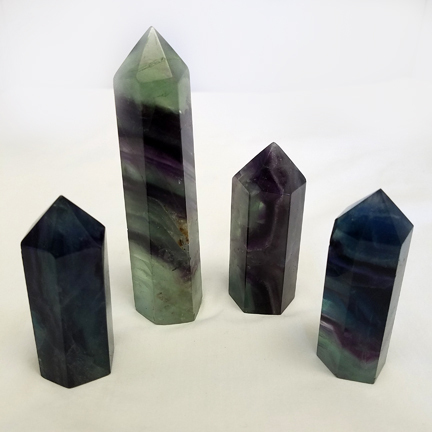 These wands are approximately 3.75"L.
Polished Chinese Fluorite Slabs are approximately .5" thick. They are translucent with any combinations of green, white, and/or purple. They looks great on our Large Vertical Stands (DSVL)! Sizes range from 1.5" x 1.5" to 3" x 3". Price will range from $3.00 to $9.00 each. This product is priced by weight so size and shape will vary. These Straight Chinese Fluorite Massage Wands are as beautiful as they are distinctive. This $5.00 wands is approximately 2.5" in length and nearly an inch in thickness. Fluorite is one of the most collectible and highly sought after crystals in the world, loved by mineralogists and metaphysical healers alike. Fluorite is an extraordinary creation of nature! Its beautiful, soft, and glassy appearace resonates deeply with the human mind like no other crystal. Fluorite supports spirituality and thought, focus and concentration, and balance in all aspects of one’s life. Sold by each. Stand not included. Sold by each. NEW PRODUCT! Fluorite is one of the most collectible and highly sought after crystals in the world, loved by mineralogists and metaphysical healers alike. Fluorite is an extraordinary creation of nature! Its beautiful, soft, and glassy appearace resonates deeply with the human mind like no other crystal. Fluorite supports spirituality and thought, focus and concentration, and balance in all aspects of one’s life. 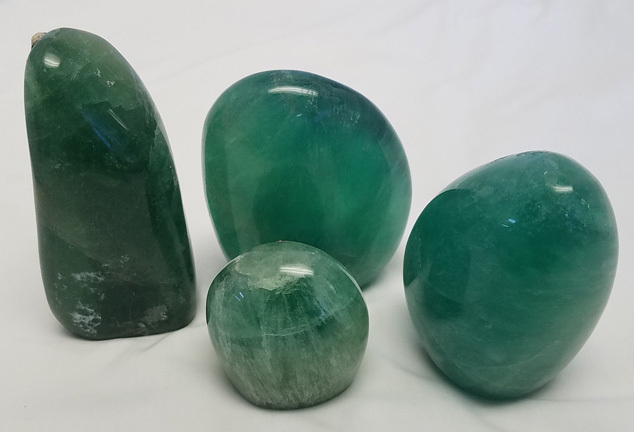 These stunning polished green Madagascar Fluorite Free Forms have a cut base for ease in displaying. The prices range from $6.00 (approx. 2" tall) up to $48.00 (approx. 5" tall). Although polished, these are products of nature and are priced by weight so they will vary in shape and size from piece to piece even in the same price point. Sold by each. NEW PRODUCT-limited availability!! These beautifully AA-Grade Polished Chinese Fluorite Points range in color from green to purple to white, usually with bands of all three colors. Sizes range from Approximately 2.75" to 5" tall. Fluorite is one of the most collectible and highly sought after crystals in the world, loved by mineralogists and metaphysical healers alike. 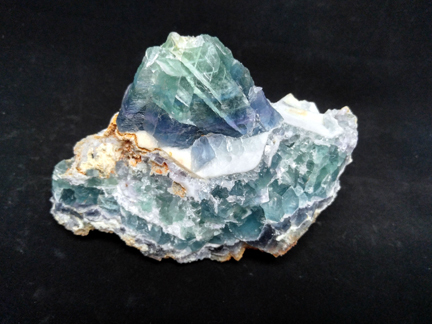 Fluorite is an extraordinary creation of nature! Its beautiful, soft, and glassy appearace resonates deeply with the human mind like no other crystal. These points are priced by weight and will vary in size and color.